Much as we passionately love Indian food, every once in a while even we need a pause from our desi staples of Tandoori Chicken, Masala Dosa, Palak Paneer and Gulab Jamun. 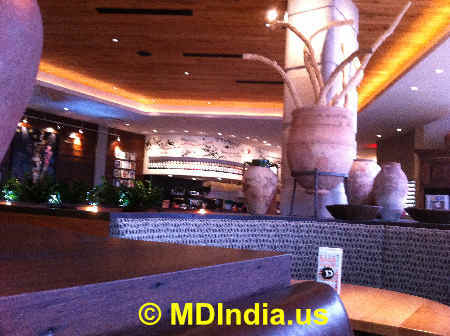 So, off we headed to the fast-casual Portuguese-Mozambican restaurant chain Nando's Peri-Peri in Annapolis (MD) yesterday. For the curious, Peri-Peri is Swahili for the African Bird's Eye chilli, a variety of chilli indigenous to Africa (source:Wiki). Although belonging to the fast-food genre, Nando's has a far superior ambiance compared to your Mac, Burger King, Hardees and Taco Bell. There are nice booths with leather seats here not those ugly, garish-colored benches you encounter at Mac or Burger King. You order and pay up at the counter and a waiter brings the food to the table. Being as usual in a famished state, we ordered Peri-Peri Chips/Fries (with Peri Salt and Perinaise dip), Butternut Squash and Couscous Salad, Peri-Peri Nuts, Chicken Sandwich, the Naughty Natas dessert and, of course, a bottle of ice-cold Portuguese Beer Sagres. What's a meal without Beer, eh? The Sagres beer was expensive ($4.95) but made for a nice combination with all those hot Peri-Peri sauces. Oh, what a healthy treat. Sure, they were not as crunchy as the Mac fries but they did not have McDonald's weird pale color either. We attribute the magic of the Nando's fries to the reddish-brown colored Peri-Peri Salt (15 cents extra) that adds a nice spicy zing. Not the pepper kind of spice but a mild red chili powder kind of spice. Perinaise comes in a small cup and can be best described as Mayonnaise Light. Not bad but nothing extraordinary either. We say, forget the Perinaise. Instead, add a few drops of the Garlic Peri-Peri Sauce on top of the fries and, again, you've got yourself a BIG Winner! 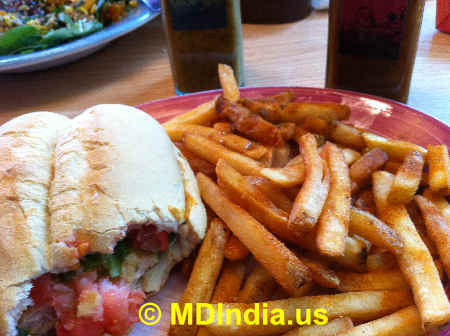 Chicken Sandwich served on a largish Portuguese roll with green leaf lettuce, tomato and mayonnaise gave no reason for any complaint. We opened up the top of the roll, added a few drops of that heavenly Garlic Peri-Peri sauce and it was sextasy redux. Our solicitous waiter informed us that the meat was fresh and came from the restaurant's custom order from a place in Baltimore. If you're into booze as much as we're, you are probably forever scrounging for some nice accompaniments. Folks, there's no better bar-snack than Peri-Peri Nuts ($2.95). A nice, crunchy combination of spiced almonds, cashews and macadamia, they're just perfect with a bottle of Sagres Beer or our favorite Gin and Piña colada cocktail. 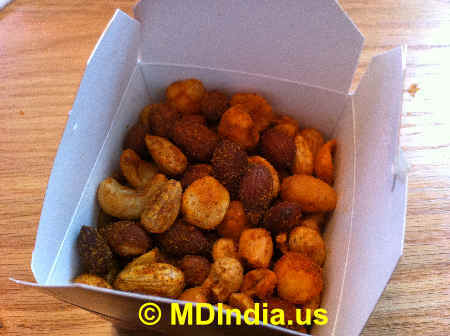 After tasting a sample, we liked the nuts so much that we placed a second order of Peri Peri nuts. Like all the other stuff we'd tasted so far, the Peri Peri Nuts too had a fresh taste and more importantly did not have the chemical after-taste and smell common to the roasted nuts purchased at your local American grocery store or Sam's Club. As were finishing up our Chicken Sandwich and Butternut Squash salad, our waiter got us our dessert Naughty Natas, a Portuguese pastry. Naughty Natas is a custard tart served on a flaky, layered crispy bread base. 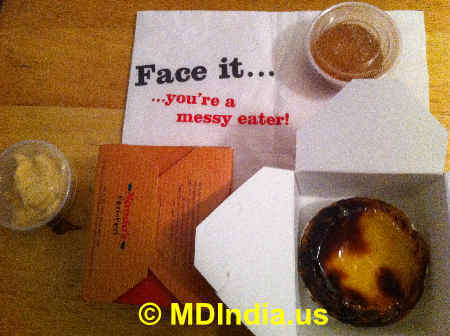 Though it was slightly low on sugar for our Gulab Jamun and Gajar Halwa hardened palate we enjoyed this Portuguese pastry so much that we placed another order for take-out. We were pleased with our waiter Danny aka Dayanand, a desi bloke from Chennai. 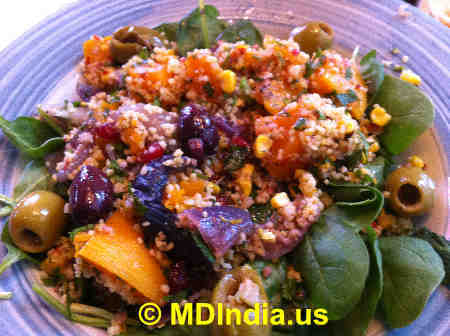 Danny went out of his way to please us and even offered to get us a replacement salad should the Butternut Squash and Couscous not meet with our approval. Hey, you get stainless steel spoons and forks too here. All in all, we had a pleasant time at Nando's in Annapolis (located in the Annapolis Mall, between Sears and Border's book store). 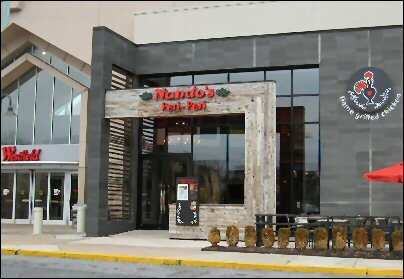 We'd definitely reconsider a repeat visit to Nando's should we happen to be in the area or drive through Annapolis.